Which brings us to tonight's feature presentation. Just over a year ago, I was rather restrained when I posted the two Quitters tapes. Let me emphasize this now: the Fuzzball EP is one of the best recordings to ever, ever come out of this city. The Quitters are one of our most criminally overlooked bands. So I'm pretty thrilled to have just received a batch of stuff from ex-Quitter/Joe 90/Ted Clark Five guy Christopher Truch. 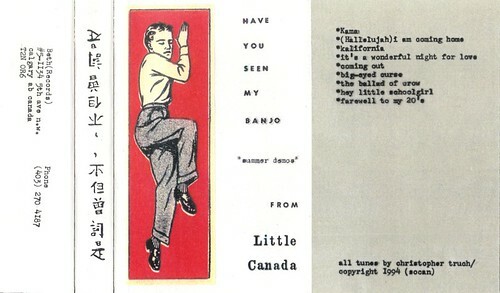 The most notable of which is this cassette from Little Canada, released a couple of years after Fuzzball and after the Quitters quit. This is more restrained than the Quitters (Christopher's output has become increasingly jazzy - in a Paul Weller sense), but great nonetheless. "Big-Eyed Curse" jumped out at me as channeling the Dream Syndicate, which is always a good thing. And a final track which my dog likes to bark at. I just got this yesterday, and you should get it today. Arif. I can't tell you how much it means to me that you posted this. I will NEVER forget James Muretich playing me this cassette sometime in early 1994. There are songs embedded in my brain on this cassette, just from a single listen.